On May 25, Turkey announced that it and the U.S. had agreed on a way forward in Manbij. Despite backpedaling after the U.S. denied that a conclusive deal had been reached, progress in the joint talks represented a step in the right direction. If there is no new provocation, and if the meeting of Secretary of State Mike Pompeo and Turkish foreign minister Mevlut Cavusoglu on Jun. 4 goes well, this could reopen the path for the two countries to deal with broader issues. The U.S. has no national interest in a broader confrontation with Turkey. The Obama administration promised the Turks that its Kurdish allies would not go west of the Euphrates. Thus Washington gains both credibility for honoring this pledge and closer relations with Ankara by agreeing to joint U.S.-Turkey security control for the area. The Americans will be able to say they are doing exactly what they said they would do under the right conditions. Turkey will gain an important political objective and a chance to further improve relations with the U.S. 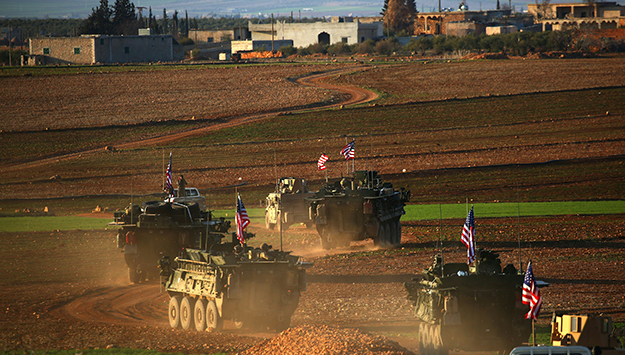 In particular, creating a system by which U.S. and Turkish forces jointly provide security along the Turkey-Syria border will build trust and allow the two parties to mend fences. To realize the potential of this first step, Ankara and Washington must now engage on broader issues as well. The most important are Russia and Iran. The Russian-dominated Sochi peace process for Syria has relegated Turkey to the role of the most junior partner. Russia greenlighted the Turkish operation in Afrin in January 2018 to embarrass the U.S. but since then has asked Turkey to withdraw. Moscow maintains relations with the Syrian Kurds as a bargaining chip in the peace process. To weaken NATO, Russia was glad to sell the S-400 missile defense system to Ankara, but it is highly improbable that Moscow will relinquish full access and control of the system to Turkey. Despite setbacks, Iran continues to push west toward Lebanon through southern Syria. Israel has importuned the Russians to pressure Iran. But the Russians are looking to leave Syria, not get further ensnarled, and Moscow needs Tehran for an ultimate peace deal. Tehran opposed Turkey’s Afrin operation, and will blunt any Turkish attempt to be key to a final peace agreement. After all, Ankara had repeated on a regular basis its opposition to an Assad government. Tehran has said it would not allow Iraqi election winner Muqtada al-Sadr to govern Iraq and remains intent on increasing its already powerful influence in Iraq. Iraq has been key to Turkish security since the days of the Ottoman Empire. Whatever aims Ankara’s government has in Syria beyond its own domestic goals, the Turks will not be able to invade deeply into eastern Syria without upending the peace process and threatening the interests of Washington, Moscow, Tehran and Damascus. Moreover, many observers consider that the Syrian Kurds have earned some right of self-defense, having confronted and repelled ISIS. Kurds protected Yazidis and saved Kobani against ISIS in 2014–15 when Turkey declined to help. In short, the next set of moves toward stability in the northwestern Middle East now depends anew on how well Turkey and the U.S. can accommodate their respective interests. There is a looming risk for Ankara, however. Congressional anger at Turkey is building for several reasons: the targeting of Turkish employees of the U.S. Embassy with criminal charges, the trumped-up charges against American pastor Andrew Brunson and the S-400 sale. The withdrawal of Turkey’s ambassador in Washington over the recent bloodshed in Gaza comes at an inopportune time for Turkey. No Arab state followed Turkey’s lead. Turkey also considers extremist rhetoric an effective diplomatic tool despite overwhelming evidence to the contrary. While professional diplomats manage this tiresome tactic in order to focus on the issues, members of the U.S. Congress have less patience. Congressional voices already have proposed sanctions against Turkey and have suggested cancellation of the F-35 sales scheduled for Turkey. Congress controls the purse strings for American defense relations. At the moment, there is a bright amber light from Capitol Hill alerting Turkey that a line could be crossed. A lot may ride on how Ankara manages its diplomacy with Washington in the time ahead.